In the midst of a relegation battle with freshly reinforced Dundee and St Mirren, and with little time to bolster the squad in the January transfer window, overhauling the team’s tactics was never going to be easy. However, Rice made a good start in this respect, leading Hamilton to a positive performance and a 1-1 draw at home to Dundee last weekend. Canning rarely made use of attacking midfielders this term, generally preferring a 5-3-2 shape. Consequently, the likes of Steven Boyd and Tony Andreu were often forced into roles they didn’t particularly suit. Rice immediately did away with this shape, instead employing a 4-3-2-1 (or the ‘Christmas tree’ formation if you’re still – really, still!? – feeling festive). Boyd and Andreu acted as dual No.10s behind new signing George Oakley, who led the front line. Alex Gogic operated at the base of midfield, with Darian MacKinnon and Scott Martin box-to-box No.8s on either side of him. Ziggy Gordon partnered Matt Kilgallon in central defence in front of goalkeeper Gary Woods, while full-backs Aaron McGowan and Scott McMann were the sole providers of true attacking width. Rice’s intentions were clear from the start, quite literally. Rather than going backwards and then long – the usual kick-off routine for most – Hamilton dribbled forward straight from the first whistle. There was an urgency about the team’s all-round play that hadn’t been seen in recent months, as well as a greater willingness to build out from the back and keep hold of possession. This could be the ‘new manager bounce’ so many speak of, but it could also be an early indication of Rice’s ideas. Andreu and Boyd had fluid roles, meaning they could move laterally across the pitch to offer a forward pass along the ground and combine with one another. With Oakley often occupying both Dundee centre-backs, the attacking midfield pair could move relatively freely between the lines and help Hamilton to break through Dundee’s midfield. They were often joined in this area of the pitch by MacKinnon or Martin, who both regularly made forward runs beyond Dundee's midfield four. Dundee defended in a 4-1-4-1 shape with Craig Curran, their lone striker, placing himself between Accies’ centre-backs and closing down the centre-back in possession at the time. An example of this can be seen in the above graphic. In doing this, Curran nullified the numerical advantage Hamilton had in build-up situations, forcing them down one side of the pitch. Meanwhile, Dundee’s midfield four generally kept their shape, screening the multiple players Hamilton got between the lines, while No.6 Andreas Hadenius marked the Hamilton No.10 nearest to the ball. When moving up to join Andreu and Boyd between the lines, MacKinnon and Martin often removed themselves as immediate passing options for Hamilton’s centre-backs to utilize. This, along with Dundee’s defensive approach, meant that while Accies consistently got two or three players between Dundee’s defence and midfield, these players could not always be accessed. Below, Martin makes a forward run to get behind Dundee’s midfield. Ultimately he drags his man with him and makes himself inaccessible to Gordon. This is a teething problem for Rice, who clearly wanted his side to break Dundee down with passes through, as opposed to going long over the top or out wide and around the side. However, if MacKinnon and Martin can co-ordinate their runs and position themselves more effectively in relation to the ball, Hamilton will be able to enjoy more penetrative possession and get into the valuable space in front of opposing defensive lines. From there, the likes of Andreu and Boyd can run at defenders, combine with Oakley and one another, get beyond the last line or at least get shots off closer to goal. Hamilton were able to break Dundee’s defensive line by drawing out their full-backs, James Horsfield and Nathan Ralph. 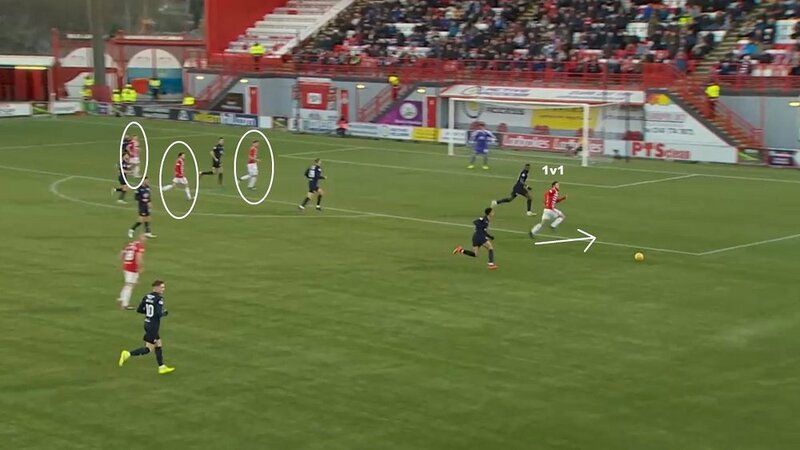 This happened through the high and wide positioning of Hamilton’s full-backs or by a central midfielder getting on the ball behind Dundee’s midfield line, as seen below. In this particular example, Hamilton are counter-attacking. MacKinnon receives the ball behind a disorganised Dundee midfield and Ralph leaves his position on the left side of Dundee’s back four to close him down. This leaves space behind Ralph, which Andreu instantly recognises and runs into. MacKinnon then finds Andreu, leaving the Frenchman 1v1 against a Dundee centre-back. Not only is this an advantageous situation for Hamilton, as Andreu has the skill to beat his opposite man or work a crossing opportunity, but it allows them to overload a less crowded penalty area – they get a 3v3 in the box on the back of Andreu’s run. Hamilton’s full-backs, McGowan and McMann, were crucial in providing width in an otherwise extremely centre-focused system. They acted not only as wide outlets for the centre-backs when building out from the back or for diagonal switches of play from the centre to the wing, but were a means of stretching the Dundee midfield four apart or drawing out the opposing full-backs. The ball-side full-back would push high down their flank, while the other would stay deep, helping reduce Hamilton’s vulnerability in transition. This balance was vital, particularly considering Dundee’s counter-attacking strategy. Curran, who was Dundee’s primary target for direct balls on the counter, would look to find one of Scott Wright or Andy Dales in space out wide, or he would chest down and lay off to a midfielder who would in turn play it out to one of the wingers. Wright and Dales both possess excellent pace and dribbling ability. In 1v1 situations, particularly on the counter-attack where the defending team usually has less cover and organisation, defenders will struggle to stop them. The deeper positioning of the far-side Hamilton full-back meant Gordon and Kilgallon weren’t left isolated in these instances. In addition, Gogic stayed reasonably close to his centre-backs to help them nullify any counter-attacking threat. Below Gogic supports Gordon in challenging Curran during a Dundee counter after a failed Hamilton attack down the right-hand side. Notice the left-back, McMann, has stayed deeper as the attack was not down his side. This may not be the catchiest aspect of Hamilton’s revised approach under Rice, but it was promising. The fact the team kept a semblance of balance when attacking is a sign that stable, sustainable possession is the aim for the new coach, as opposed to mindlessly overloading opponents with sheer numbers with little thought for defensive transitions in an attempt to stir up positivity with a fan-base starved of exciting offensive play. Despite the improved possession and the potential that came from getting numbers between Dundee’s lines, Hamilton found themselves 1-0 down. Even before conceding, with the possibility of a draw or defeat in his first game in charge looming, Rice was aggressive in his substitutions. Before the hour mark he brought on Steve Davies for Martin, going from 4-3-2-1 to a 4-2-2-2 system. Davies’ physical presence up front offered Hamilton an outlet for long balls, which became more popular as they chased the game. But these were not hopeful punts up the park – rather, Davies offered Hamilton an alternative way of getting their attacking midfielders on the ball. When they couldn’t go through Dundee’s midfield, Davies allowed Accies to go over the top. From there he could knock the ball down to Andreu or Boyd’s replacement Mickel Miller, or he could flick on and one of the 10s (or Oakley) could make a run in behind. This highlights another attacking advantage brought by Rice’s system. By having the two attacking midfielders operate fairly centrally, these players can then support the striker(s) when Accies do decide to play long balls. When going direct from back to front, the No.10s can position themselves around the striker and look to receive the knock-down/flick-on, or help to win the second ball should the striker lose his aerial duel. Either way, it’s a more sustainable method of attacking directly than simply hitting it into a channel for an isolated forward to chase. Dundee spent most of the match defending and, when they did regain possession, tended to go long to Curran and aimed to counter-attack at speed through their wingers. As a result, it was difficult to get a thorough look at how Hamilton will defend under Rice, though there were some clear benefits to their new system. Their front three of one striker supported by two attacking midfielders gave them good access to the whole Dundee back line when pressing their build-up. Oakley would pressure the centre-backs while the ball-side attacking midfielder closed down the full-back and the far-side attacking midfielder shifted across to cover behind more centrally and block/threaten passes into midfield. Considering he had just two days to work with the players before this match, Rice can be pleased with the way his Hamilton played against Dundee. They had the majority of possession and showed greater composure and patience on the ball, as well as an improved attacking structure. In the end, they perhaps deserved more than the draw they eventually obtained. There are some tactical caveats, of course. Dundee were set up to counter-attack, so it will be interesting to see how Accies fare with the ball against teams that want to control games or apply more concerted pressure on their build-up. It’ll also be worth noting how Rice sets his team up in future games – will he stand by this 4-3-2-1 shape or change game-by-game? And how will his side defend when the opposition aren’t quite so focused on direct play and counter-attacking? With around three months left in what has been a competitive Premiership season, Hamilton can’t expect to finish higher than 10th and narrowly avoid the relegation play-off. However, the club’s ownership and fans want Rice to look beyond the league position and implement a more exciting brand of football. On that front, the early signs are good. Help us continue to analyze football in Scotland by donating to our GoFundMe. These donations will help us continue to provide statistical and tactical analysis on the SPFL Premiership not seen anywhere else.